Just look at her, all dressed up in her pretty red, white and blue bow and dress for Memorial Day. What a pretty baby! You do such a good job making them look great. But of course, kids are still kids, and you know what that means. It’s like “Short Attention Span Theater”, 24/7. But we’ll give them a break. After all, that’s kinda their job. And, of course, to help us remember to lighten up! Ah, to be a kid again. So when it comes to caring for those fancy holiday clothes, just let it go, and let Jimmy’s handle it. We’re here for you. Trust us; we understand. With our free, convenient pickup and delivery service, Jimmy’s Cleaners is convenient for all your needs. We love making our customers’ lives a little easier. 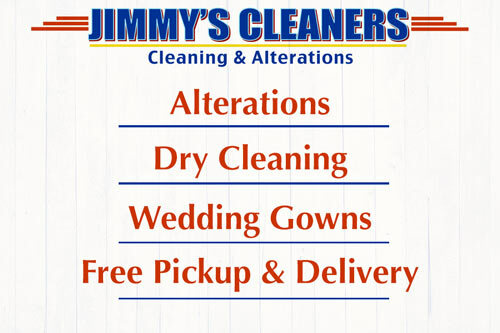 Jimmy’s Cleaners and Alterations has five locations in Williamson County, including Spring Hill, Franklin and Brentwood We feature both dry and wet cleaning, shirt laundry, uniforms, leather & suede, fire restoration, water damage, bedding, draperies and wedding gown preservation. Just ;like the name says, specialty garment alterations are available as well. To schedule a pickup, give us a call at (615) 599-3605.